Earlier this year, director Kevin Smith suggested that filming for "Clerks III" would take place in Philadelphia this summer, but that didn't end up happening. The change of plans had to do with Smith's attempt to pin down a location to shoot the sequel to 1995's slacker cult flick 'Mallrats.' On Thursday, Smith tweeted that he and StarStream Entertainment have chosen Chester County's Exton Square Mall and will begin filming in January. In June, Smith alluded to the possibility that "Mallbrats" might be filmed at the Granite Run Mall in Media, which is set to be demolished sometime this fall, but complications got in the way, according to the Delco Times. With plans for an explosion in the film's final act, Smith hoped to have free reign in a place that was slated to be torn down anyway. 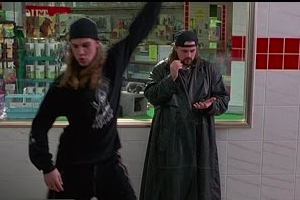 Much of the original cast will return for the sequel, including Shannon Doherty, Jason Lee, Joey Lauren Adams, and Jason Mewes, who teams up with Smith for the leading duo of Jay and Silent Bob. So far, Ben Affleck and Claire Forlani, who appeared in the first film, have not signed on for 'Mallbrats,' but Smith is reportedly recruiting them. 'Mallrats' forms part of Smith's 'View Askewniverse' series, in which recurring characters and motifs cycle through his projects. Wherever Jay and Silent Bob are involved, expect plenty of lewd comments, happy dances, improbable escapes and one-sided conversations. If you're fuzzy on the original plot, the following clip from the original spells it out pretty clearly.